The 10 Best Candy Shops in North Dakota! Everyone knows that sweet treat craving. Very few people can avoid it! When you need to indulge your candy craving and the importance of pampering oneself, North Dakota has what you’re looking for. Here are the 10 best candy stores in the state! Located across from West Acres Shopping Center, Sweet Dreams is just that. Selling everything from homemade fudge and handmade chocolates to gelato ice cream and old fashioned candy, the store is just what you need when the candy craving hits. Sweet Dreams also sells unique gifts, home décor, coffee, soups, and sandwiches. Home of the famous “chipper,” a chocolate covered potato chip, Widman’s has been making candy for several generations. 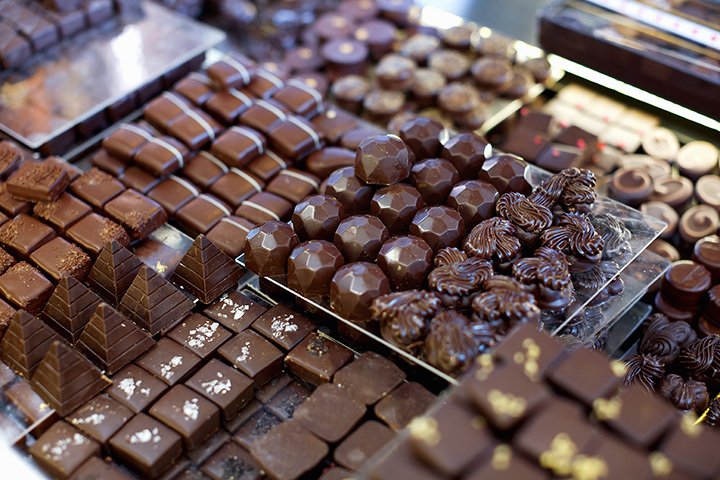 Specializing in all things chocolate, the store offers a variety of items that are dipped in either milk, dark, or white chocolate, as well as traditional chocolate delicacies like truffles and turtles. Home to video games, laser tag, and mini golf, Zars Fun Center is also home to some of the best retro candy in Grand Forks. Whether you are craving some old-fashioned taffy, gummy candy, or something that reminds you of your childhood, Juju Sweets has what you are looking for. You can even get in a game of “Pac Man” while you munch. Home to the world’s largest gummi bear and chocolate strawberries that are to die for, Northwoods is the hottest place to be when it comes to candy. The store also carries a wide variety of candy, including salt-water taffy, licorice, gummi candy, fudge, retro candy, and chocolate covered just about anything. A smaller shop located in downtown Bismarck, Dakota Nuts-n-Candy carries over 50 kinds of nuts, including those roasted, salted, candy coated, chocolate covered, and spicy. The store also carried traditional and nostalgic candy. Home to everything from jewelry and home décor to sausages, soups, and bread mixes, Home Sweet Home also carries a wide variety of specialty candy. If you have a hankering for roasted nuts, homemade caramel, chokecherry chocolate, or any number of traditional candies, a visit to Home Sweet Home is in order. Although new to the Williston business scene, Lynden Chocolate & Candy Shoppe is quickly winning customers over with its exceptional products. The shop carries a wide variety of homemade chocolate, caramels, fudge, caramel corn, taffy, and other candies. Sisters’ Chocolates specializes in just that. Offering 18 homemade milk, dark, and white chocolate products, customers have quickly branded the store as a state-wide favorite. If you are looking for unique chocolate products, a visit to Sister’s should be the top of your to-do list. What do you get when you take a book lover and add a candy aficionado? You get Sweets ‘N Stories, of course. In addition to selling a wide variety of sweets, the store also doubles as a book store. As if that wasn’t enough, Sweets ‘N Stories is also an espresso bar and eatery. One stop shopping at its finest. Looking for old fashioned candy? Craving a thick and creamy malt? The Candy Jar is the perfect place for those looking for a quick fix for their sweet tooth. We hear the caramel apples will leave you breathless.